Golf Ball Markers are a golf outing gift every tournament should consider. Choose from our wide variety of novelty ball markers or have a customized ball marker created with your tournament or sponsor logo. 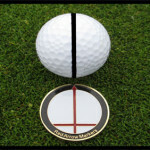 Logo Ball Markers are a golfer gift your participants will use and appreciate. Golf ball markers come in differing sizes and forms including: double sided metal, epoxy dome finish, Custom Poker Chips and Red Arrow Markers. Combine a ball marker with a Greens Towel or other tournament prize to make your tournament gift bag extra special. Our wide variety of “Theme” Novelty Ball Markers are available for at once shipment and may perfectly match your golf tournament needs. 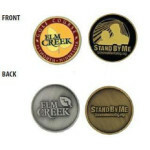 Sample Ball Markers can be ordered. 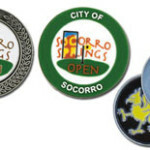 Custom logo ball markers are a hit at every golf tournament outing, especially company outings. Turnaround times vary from 10 days to 6 weeks depending on your selection. Click “Request Quote” below for a quote or further information about our custom logo golf ball marker options. Minimum quantity is typically 50 units. Set up fees may apply.